CHANTILLY, VA. — Former Pittsburgh Steelers defensive tackle and Pro Football Hall of Famer, Mean Joe Greene, will appear on Sunday, July 13, 2014 from 12:15-1:15 pm to meet fans and sign autographs at the CSA Autograph & Memorabilia Show at Dulles Expo Center located at the Chantilly Shopping Center in Chantilly, VA.
Photo shows Pro Football Hall of Famer Joe Greene speaking about the Steelers in a 2012 interview. Joe Greene is pro American football defensive tackle who played for the Pittsburgh Steelers from 1969-81. Throughout the early 1970s, Greene was one of the most dominant defensive players in the National Football League, winning two NFL Defensive Player of the Year awards, as well as earning five first-team All-Pro selections. He is widely considered one of the greatest defensive linemen to ever play in the NFL. Known as ‘Mean Joe Greene,’ he was the cornerstone of the legendary “Steel Curtain” defense. 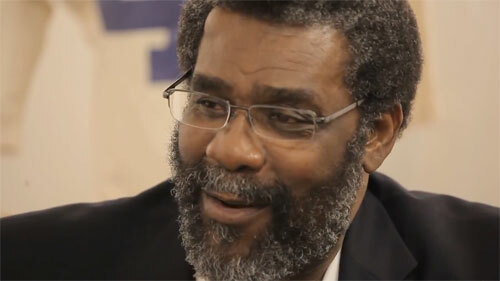 Watch Pro Football Hall of Famer Joe Greene speaking about the Steelers in a 2012 interview. Sports Speakers 360 is a booking agent for pro athletes. If you would like to book Joe Greene for a speaking engagement, appearance or endorsement, contact Joe Greene’s booking agent for fees at 1.855.303.5450.